Enbiggerate, fab word, in use from now on chez Russ/Toole!!!!!! This is seriously unfair, Mr Finnemore! How can anyone possibly have so much talent? Me, I can't draw curtains, never mind being hilarious, witty, sharply-observing and all. Are you going to tell us you bake superb cakes too? Wow, he looks amazing! I love all the wrinkles around the mouth (is there a term for those?). If so, any chance of sketching our very dear Queen, seeing as it's her big celebratory year and all?! If not, you are still truly marvellous. Or on ladies, "smile lines". Love it, kind of looks like one of our US presidents of old. Really now, with all of your talent, have you ever thought of working with clay or stone? Would love to see what you could do with a large hunk of marble. Just think, the Finnemore wing of an art museum in 2050 with your sketches selling for millions! John, when would recordings of cabin pressure series 4, which absolutely MUST happen be likely to finish? Me and my friend would probably have to get the almost 11pm service back to the sticks from st pancras, cos overnight costs would prevent her from coming, would it be feasible? 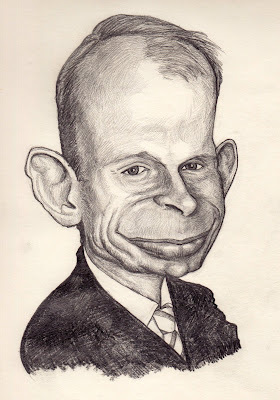 About 25 years ago, there was a children's TV programme called "The Riddlers" and the Andrew Marr pic reminded me of one of the main characters, Mossop.